This book had interesting characters, plot, and information about antiques. It wasn't one of those books that clubbed you over the head with detail, but it had enough to be entertaining as well as informative. I liked the main character, an ex-FBI agent working in antiques. He's got a butler, an agoraphobic wife, and a nutty sister-in-law. Overall, he's handling the civil life fairly well even though there are attempts to draw him back into policing when he finds evidence of murder on the site of his newly acquired estate full of antiques. I'm enjoying this series very much. I also enjoy learning about antiques and the author has lots of reference material in the back of the book. Enjoyed characters, Seattle setting and antique information. Former FBI agent turned antiques picker Jeff Talbot lives in an inherited mansion on Queen Ann Hill in Seattle, complete with a butler and antique car. After a kidnapping, his wife is suffering severe agoraphobia (sort of), and refuses to leave their bedroom. Meanwhile, Jeff has to make a living off of picking antiques, and has just scored big time by purchasing two houses full of old junk, sold after the elderly hoarder who owned them died. At the houses, Jeff discovers not only wonderful antiques, but a suspicious bloodstain--and suddenly his assets are frozen until the mystery is solved. Meanwhile Jeff discovers, among the antiques he'd already removed from the house, a steel "marriage casket" box full of letters from WWII, that may hold a clue to the life and death of Verena Rose.This is kind of a mash-up of cozy mystery with a more gritty story, and I liked it fine even though I pegged the murderer pretty early on. 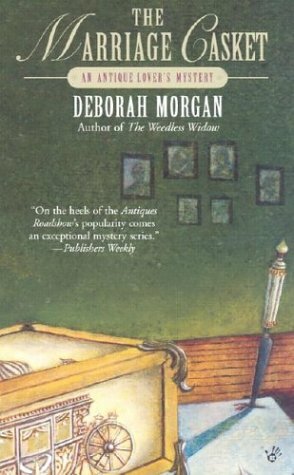 I'm not a huge fan of antiques, but I liked all the descriptions of the items in all the various places--the author does a great job of setting a scene full of objects. I'm still not sure I understand what Jeff is doing with a butler and mansion when he has to scramble for money--maybe I missed something. I also thought there might be more depth to the mystery than there was, and that the marriage casket would play more of a role than it did. But this is a basic profession-based cozy mystery for antiques lovers who don't want something narrated by a cat, as it were. Deborah Morgan has done it again: taken the chracters we grown to love and given them new situations and a new interactive mystery that you won't see coming.It is only a short while since Jeff and Sheila were so badly shaken with her abduction. Their world has become even more insular as Sheila, agoraphobic on a good day, won't leave the bedroom.The Talbots are well off, but even Jeffis feeling the pinch as he has alarms installed, and then unistalled...has psychiatrists and all sorts of counselers making house calls, even gets Sheila's ditzy sister Karen in for the holidays to possibly get Sheila out of the one place she feels safest.Jeff's still dealing with Blanche Apply and her antiques. Greer is overstressed and overworked. The haul he got from the Rose estate gets tangled up as it's discovered that Vendea Rose was killed and didn't just have a heart attack, as her nephew is arrested. Discoveries galore pepper this wonderful book that you could read in a concentrated afternoon. from the book: "He had learned a lesson that day. For all his love of antiques, they were cold, inanimate objects. But the elderly were living links to the past - and he had been guilty of dismissing them, treating them like one-dimensional has-beens. Not even has-beens, really, because he hadn't given them credit for being anything. He had forgotten that these were once teenagers, facing the same decisions, the same temptations, that teenagers face today. He had forgotten that they had fought wars, shaped futures, loved one another,survived. He wasn't alone, either, although realizing it was no comfort." This author has written only a few novels - 5 in this series, the last in 2006 - and they aren't easy to find. However, she certainly deserves a wider audience. This is a very good tale. You will learn early on that "casket" was once a word denoting a small box for keepsakes, not a coffin. When antiques picker Jeff Talbot discovers one filled with letters among the belongings of an elderly woman whose estate he has purchased, the mystery begins. Then Jeff, an ex-FBI agent, realizes she didn't die of natural causes. She was murdered. Read the rest yourself. Highly recommended. This is my second time to read this book. I like the whole series. The last book was in 2006 and I am impatiently waiting for a new one.One of the interesting things about this series is the antiques/collecting information. The first four in the series have a bib and a web site list. Although the ambiance in this series is usually spoiled by the way out of whack marriage situation of the protagonist, each book is often saved by the very interesting details about collectives and history in general. Susan, Main patron, June 2015, 3 stars:"An Antique Lover's Mystery" - Jeff Talbot is an ex-FBI agent who's now a picker. He buys the contents of an elderly packrat's house, and discovers evidence she was murdered. This is a pretty good mystery, with some knowledge of antiques thrown in. There's more antiques than mystery in this series, but I like it. Also, this one had more human interest than the last two. On to #4! Good plot. Still love the cast of characters. Love Jeffrey. I really like these books and characters. Never read this author again! I loved this book and didn't want to put it down once I started reading it. I love the characters and the human factors that they displayed. Another good mystery mixed with antiques.